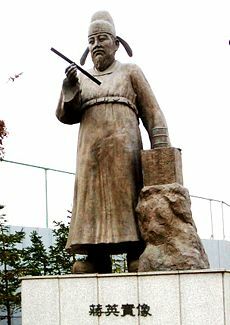 Jang Yeong-sil was a fifteenth century Korean scientist and astronomer during the Joseon Dynasty (1392-1910). Although Jang was born into the servant or slave class, Cheonmin, King Sejong's new policy of breaking class barriers allowed Jang to be recruited into the national civil service and to work at the royal palace. Jang's inventions, such as the rain gauge and the water gauge, highlighted the technological advancements of the Joseon Dynasty. The date of Jang's birth is unknown, primarily due to Jang's low birth status as a gwan-no. East Asian literature is inconclusive about the obligations and freedoms of Korean commoners because of complexities with social classification. At the age of 10, Jang was separated from his mother, a gwan-gi, (kisaeng), and he was sent to a civil court in Dongnae-hyeon  There, he displayed talents in crafts and engineering by building machines to make the lives of his fellow workers easier. He also built aqueducts made out of bamboo shoots and canals for water irrigation. By floating a wooden dish upside down in the opening, Jang prevented spillage from jars during transit  Jang also fixed instruments in disrepair. King Sejong the Great instituted a policy of selecting officials based on their talent, not by their wealth or social class. Jang's fame gained him entry into the royal court at Hanseong (present day Seoul), where selected commoners displayed their talents before the king and his advisers. Jang met Sejong's expectations in crafts and engineering and was allowed to work as a government official in the palace. The talented scientists recruited under King Sejong's new program worked at the Hall of Worthies or Jiphyeonjeon (집현전; 集賢殿). Korean celestial globe first made by the scientist Jang Yeongsil during the Joseon Dynasty under the reign of King Sejong. 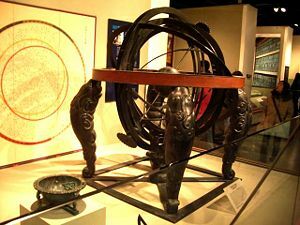 Sejong's first assignment to Jang was to build a celestial globe to measure astronomical objects. Books obtained from Arabian and Chinese scholars were not complete in their instructions, because these devices could also be used for military purposes. After two months of study, he made a spherical device that could perform with mediocre accuracy. One year after his first attempt, in 1433, Jang made the honcheonui (혼천의, 渾天儀). The Honcheonui depended on a waterwheel to rotate the internal globe to indicate time. Whether day or night, this allowed the instrument to be updated on the positions of the sun, moon, and the stars. Later celestial globes (i.e., gyupyo (규표) could measure time changes according to the seasonal variations. These instruments, along with sundials and water clocks, were stationed around the Kyonghoeru Pond in Kyongbok Palace and were used by the court astrologers. The success of Jang Yeong-sil's astronomical machines was marked in 1442 C.E. when the Korean astronomers compiled their computations on the courses of the seven heavenly objects (five visible planets, the sun, and moon) in Chiljeongsan (칠정산). Scaled model of Jang Yeong-sil's Self-striking water clock. Self-striking water clocks had already been invented by the Arabians and the Chinese (in 1091), and a more primitive form was in use by the Koreans. Although there is no archaeological evidence, Samguk Sagi records that an office overlooking the use of water clocks had been established during the Three Kingdoms Period. The Korean version consisted of two stacked jars of water, with water dropping from the top to the bottom at a measured rate. The level of the water indicated the time of the day. This was very inconvenient because a person had to be always be on guard, so that at each hour he or she could bang a drum to inform the public. Upon hearing about the usage of self-striking water clocks in foreign countries, Sejong assigned Jang and other scientists to build a clock emulating such automatic devices. They failed in developing an operational water clock. Therefore, Jang went to China to study the various designs of water clocks. When he returned in 1434, Jang created Korea's first water clock, Jagyeokru (자격루). This water clock did not survive; however, reconstructions of the Jagyeokru based on text descriptions have been made. Circling the clock were 12 wooden figures that served as indicator of time. There were four water containers, two jars that received the water, and 12 arrows floating inside the lower container. As the water from the upper containers seeped down the pipe to the lower container, one of the arrows would tilt a board filled with small iron balls; a ball would roll down a pipe to a container of larger iron balls. The collision would cause the larger balls to travel down a lower pipe and hit a giant cymbal, announcing the time to the community. Then, the ball would land on another container, which was part of a complex of levers and pulleys that activated the motions of the wooden figures to indicate time visually. Model of a Korean sundial first made by Jang Yeongsil during the Joseon Dynasty. 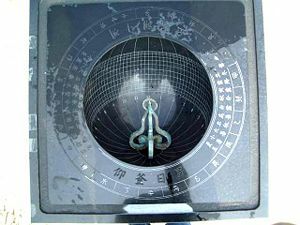 The use of Jang's water clock grew throughout the country. However, water clocks were very costly, and the cheaper and more manageable alternative was the sundial. 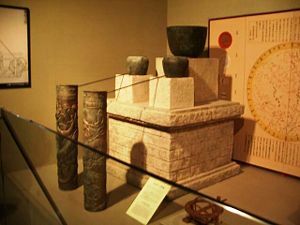 Jang, Ichun, Kimjo, and other scientists made Korea's first sundial, Yangbu Ilgu (양부일구) (仰釜日晷), which meant "pot-shaped sun clock staring at the sky". Yangbu Ilgu was bronze in composition, and consisted of a bowl marked with 13 meters to indicate time and four legs jointed by a cross at the base. Seven lines crossed the 13 meters in different curves to compensate for the seasonal changes of the course of the sun. Yangbu Ilgu and other variants, such as the Hyunjoo Ilgu and the Chunpyung Ilgu, were implemented in strategic spots, such as the main streets with heavy traffic, so that the people could be well informed of the time. To compensate for the high illiteracy rate among the commoners, 12 shapes of animals, such as mouse, tiger, and cow, were engraved in juxtaposition with the meters. No Choson Dynasty sundials that were made during King Sejong's reign have survived. All are thought to have been destroyed during the Japanese invasions of Korea (1592-1598) (임진왜란). From a discussion with his generals, Sejong learned that Korean melee weapons were duller and somewhat heavier than those of the neighboring countries; therefore, he sent Jang to Gyeongsang province, where he had spent his earlier life, to develop metal alloys for various weapons and tools. Since Jang used to be a gwan-no, he had already acquired much knowledge about metal working, and knew the geography of the area. Jang surveyed the available metals and their characteristics, and presented his research to king and the generals, contributing to the development of Korean weaponry. Korean economy during the Choson Dynasty was agriculturally based, and its economy was vulnerable to elongated or consecutively occurring droughts. Therefore, there was need for ways to better manage water. Although rain gauges had been used in ancient Greece and India, Jang invented Korea's first rain gauge in 1441, called the cheokugye. (측우기), By 1442, a standardized rain gauge with dimensions of 42.5 cm (height) and 17 cm (diameter) was introduced throughout the country to gather data on the yearly averages of precipitation throughout the different regions of the country. To allow better water management, the king asked the scientists to figure out some ways to inform the farmers of the available amount of water. In 1441, Jang invented the world's first water gauge, called Supyo (수표). It was a calibrated stone column placed in the middle of a body of water, connected by a stone bridge. Jang's extraordinary accomplishments earned him much trust of the king. Some government officials were very jealous of Jang, especially when he had achieved so much regardless of his common origin. Furthermore, as Korea's society was rooted in Confucianism, scientists and engineers were held in low esteem in parallel with craftsmen. In 1442, King Sejong ordered Jang to build a gama, an elaborately decorated Korean sedan chair. The gama broke while the king was traveling, and Jang was held responsible. Although the king was against the decree, Jang was jailed for a long time, and was expelled from the royal palace. Later events of his life, including the date of his death, were not recorded. ↑ Jang Young Sil Science High School Retrieved January 4, 2008. ↑ .Retrieved January 4, 2008. ↑ Baek Seokgi. Woongjin Wi-in Jeon-gi #11 Jang Yeong-sil. (Seoul: Woongjin Publishing, 1987), 17. ↑ Korean History Project Korean History Project.Retrieved January 4, 2008. ↑ Park Seong-rae Indiana University Resources The History of Science in Korea. Retrieved January 4, 2008. ↑ National Folk Museum. Introduction to the Folk Museum. Retrieved January 4, 2008. ↑ ChinaCultureMall .History of Typography in East Asia. Retrieved January 4, 2008. ↑ Julian RubinThe Invention of Movable Type. Following the path of discovery: Johann Gutenberg. Retrieved January 4, 2008. ↑ Academy of Korean Studies Glossary of Korean Studies. (in Korean). Retrieved January 4, 2008. ↑ fobst Federation of Busan and Technology(in Korean)Retrieved January 4, 2008. ↑ kaeri Kaeri Web MagazineRetrieved January 4, 2008. ↑ S.S. Kim, "Comments on the Chinese claim for the invention of Chugugi" J. Korean Meteor. Soc 24 (1988): 1–13. All links retrieved March 21, 2018. Seoul National University profile (in Korean). This page was last modified on 21 March 2018, at 14:51.